Sunday saw Steven Gerrard's Rangers secure his first away win as the club's manager after a 1-4 victory over Hamilton. The win marks the side's fifth Scottish Premiership win this campaign, leaving the Rangers at five points behind leaders Hearts. The result also means that the Rangers have now won their last seven visits to Hamilton. The Rangers' goals came from Ryan Kent in the 41st minute, James Tavernier in the 84th and 87th minute and A Morelos in the 94th minute. Speaking after the game, Rangers boss Gerrard said, "It gets that pressure off us." "People were talking before the game that we hadn't won away from home this season." "Sometimes you've got to win when we're not at it and have to grind results and I thought today we grinded one out." "In terms of the result, I'm very pleased. It's a big three points from us." "If you take into consideration that it's after international players have had some time off, it's a tricky environment with the plastic pitch, I'm pleased with the players, the way they showed character at 1-1 to go and win the game, but we've played better." The first Rangers goal marked Kent's third goal of the season, having previously netted in his side's defeats to Dundee and Hearts. Kent joined the Ibrox outfit on a season-long loan from Liverpool and appears to have been putting up decent performances for Gerrard's side. Following the game, Liverpool fans have expressed their excitement not only for their beloved legend Gerrard for his managerial venture but also for Kent. Some are even begging Liverpool boss Jurgen Klopp to start the 21-year-old winger once he comes back to Anfield. What a brilliant finish! The lad's in very good form! 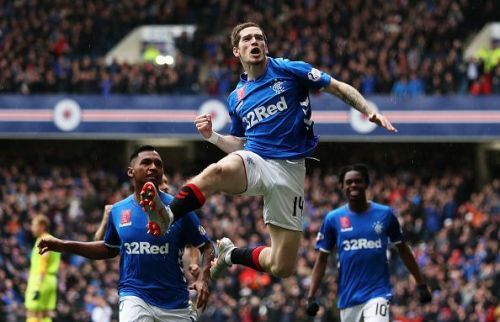 Sign Ryan Kent immediately he's deadly , reckon Liverpool will let us keep him ?